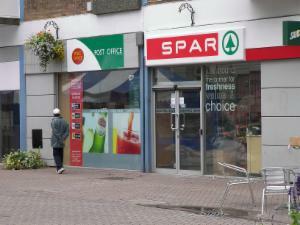 I have lived in Nuneaton since 1996 and have noticed many physical changes since then. Below you'll see some photographs of places you might remember. The black and white ones aren't really old - I used black and white film that day as an experiment. Using a digital camera nowadays makes taking, manipulating and storing photographs quite easy. 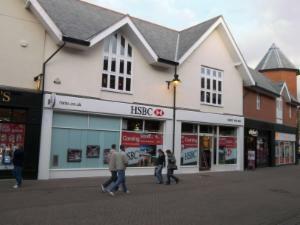 The new HSBC building on 8th December 2006 - three days before it opened. The old HSBC building on 8th December 2006 - it's last day of opening. 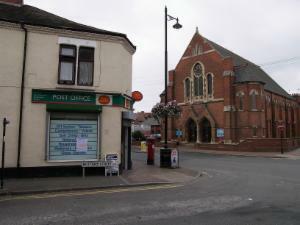 The Crown Post Office on 23rd August 2006 - the last day of operating. I needed to get the annual road tax for my motorbike (£15.00), so used the opportunity to take some photos. It's strange how I remember queuing many times for at least twenty minutes to get served. However, within a minute of starting to take a few photos, the manager came out, asked who I was and told me to stop "for security reasons". 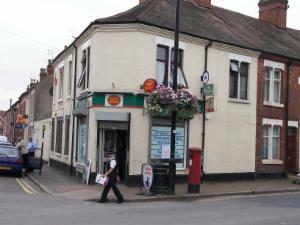 This is the new Post Office in Harefield Road on 23rd August 2006 - the day before it opened. It closed on 18th September 2010. 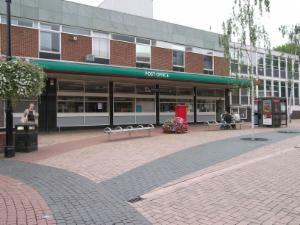 The newest Post Office opened on 22nd September in Abbey Gate (Heron Way). 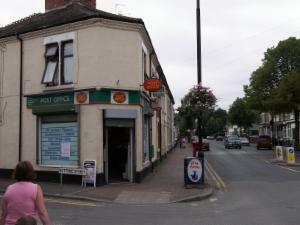 The following three photos of Manor Court Road Post Office were taken on 28th August 2008. 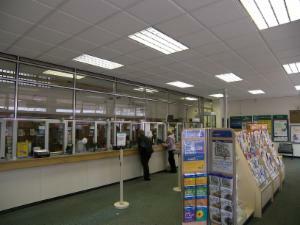 This was the day after the Post Office announced it was closing this branch along with many others. It could be closed as early as September. This photo of the Boer War Memorial in Nuneaton was taken on 26th January 2006 for a competition on my other website. Known locally as the Buller Memorial, it was 5 feet tall and weighed more than a ton. Amazingly it was stolen in the early hours of 14th November 2006 - two days after Remembrance Sunday. 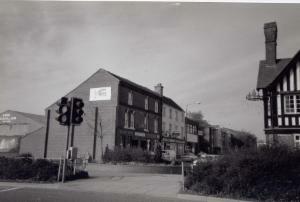 The following photos were all taken on 31st October 1995. I took quite a few photos that day travelling around Nuneaton. It's surprising how a town can change in only a few years. 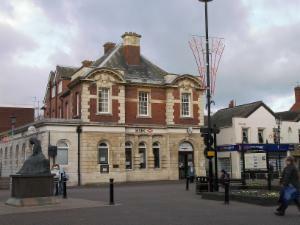 The former Police Station. 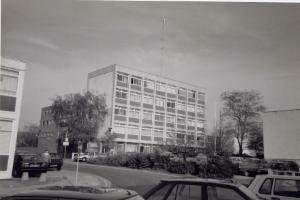 It was demolished in 2003. 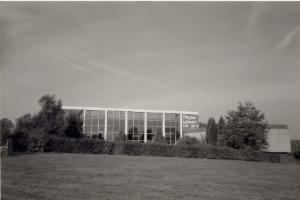 The former Pingles Leisure Complex. This scene looks similar today. The Halifax has been replaced by a phone shop. The Halifax was earlier the Leeds Permanent Building Society. My father-in-law was the Branch Manager there for several years in the 1980s. "Say the Leeds and you're smiling." Here is Leisure Music on Upper Abbey Street. I hired a second floor room for many years where I taught the piano. Here is what the scene looks nearly thirteen years later. In May/June 2008, a bus "gate" was made here for use during peak times. 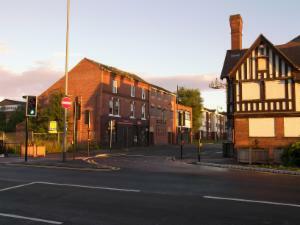 Leisure Music has been replaced by Connexions, the sofa shop (before that a motorbike shop) was knocked down and replaced by a Hindu Community Centre and the Pub opposite has been closed and boarded up. 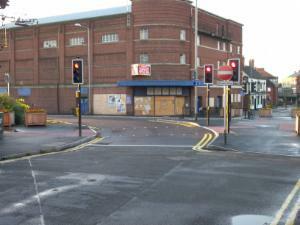 A view from the opposite direction (below) shows another boarded up building in Nuneaton - the former Ritz Bingo Hall/Cinema. 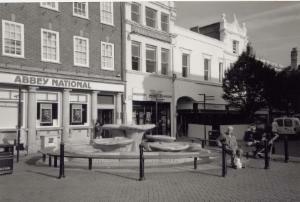 There is a very good website on the history of Nuneaton here. This site is Copyright © John Stephenson 2006-2019. You will need to ask for permission if you want to use any of the contents elsewhere.